Salt Lake City’s forgettable and occasionally ridiculed flag may soon need to move aside for a new banner, with city officials this week taking the first step toward a potential redesign. Mayor Jackie Biskupski on Wednesday announced the launch of a public survey, seeking input on the current flag and suggestions for new municipal imagery. The survey, which can be found at www.slc.gov/flag, is scheduled to run until Dec. 21. Survey responses will be used to create a set of guidelines for a public call of new flag submissions, which will be narrowed down to finalists by a selection committee, according to Matthew Rojas, a spokesman for Biskupski. Rojas said the goal is to have a final selection made by the spring of 2019, which would then be proposed to the city council for formal adoption. The survey begins by showing examples of the Chicago and Amsterdam flags — considered to be exemplars of design by vexillologists — describing the basic principals of flag design, and linking to the popular 2015 TED Talk on flag design by podcaster Roman Mars. 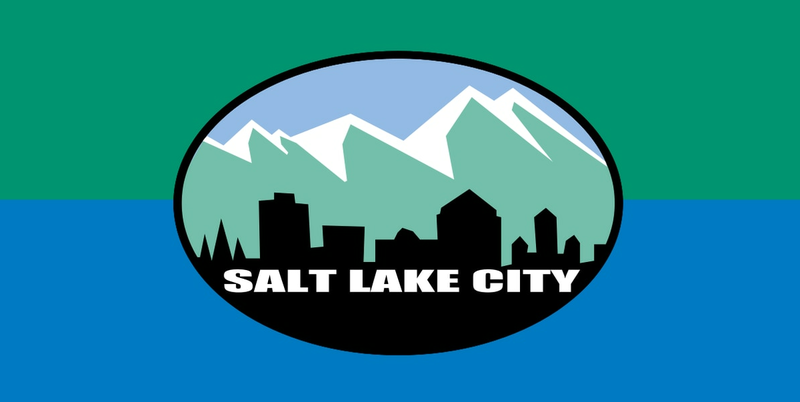 Salt Lake City’s current flag notably violates many flag design principals, particularly its use of lettering and multiple colors. It was adopted during the administration of former Mayor Rocky Anderson to replace a hand-drawn flag that prominently featured imagery from The Church of Jesus Christ of Latter-day Saints. Jorrien Peterson, a Utah graphic designer who launched a petition to change the current Salt Lake City flag, said he had mixed feelings about the start of a redesign process. He said it’s exciting that something may finally happen, but he also worries the city could follow other redesigns around the country where sub-par designs were adopted or a failure to reach consensus indefinitely stalled the creation of new flags. But he added that the decision will ultimately be made by members the city council, rather than someone from a design or vexillological background.